Freebies like continental breakfast and local calls make savings simple at America's Best Inn - Beaufort. This two-story hotel has 50 rooms and exterior corridors. You can catch a movie with cable TV and DVD players are available upon request. Clock/radios and coffeemakers are also available. Hungry guests can silence their rumbling tummies with muffins and pastries at the free continental breakfast. Take care of important work at the 24-hour front desk which offers copy and fax services. Local calls are free. The hotel is three miles from downtown Beaufort. Enjoy a unique musical interlude at the Kazoo Museum one mile away. Shop and dine at Beaufort Town Center a retail complex three miles from the hotel. Outdoorsy types can fish and boat at Hunting Island State Park a 25-minute drive. Parris Island the home of the Marine Corps Recruiting Depot is a 20-minute drive. 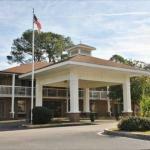 The hotel is six miles from Beaufort County Airport.